Postcard from Aldo Bacci, to his father Ruggero Bacci, March 11, 1942. 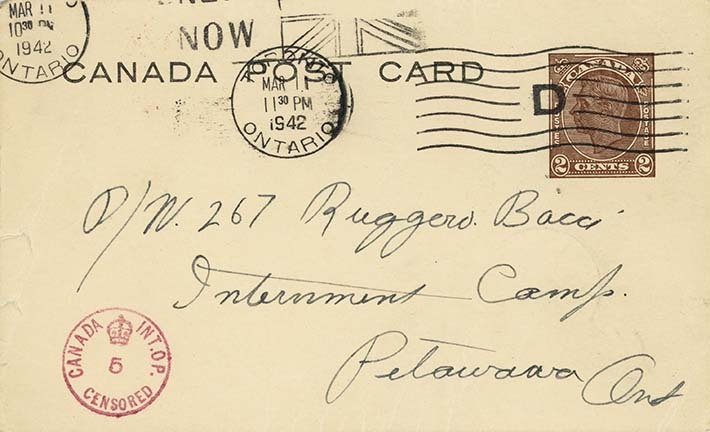 The postcard is written in English and is sent to Petawawa Internment Camp. Bacci's son Aldo was 15 years old when his father was interned. He had to quit high school to help support his family. When his father was released and returned home, Aldo received notice that he was conscripted into the Canadian Army; however, he did not serve overseas.